The tuning firm Novitec Rosso just can’t keep their hands off of various Ferraris. 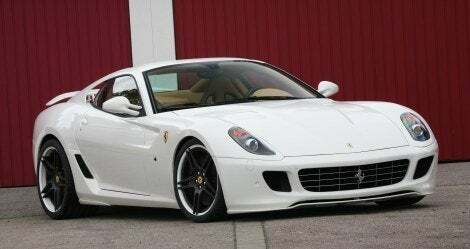 In this case, we’re talking about the Ferrari 599 GTB, a very potent car to begin with. There’s always more power and performance to be gleaned from any given car, even one as good as a Ferrari 599, so what does Novitec Rosso have up their sleeve? They summed it up this way: An Extra 40 hp, Striking Design and Exclusive Accessories. OK, no probs there really. The world being what it is, they’re probably hitting three of their target markets main areas of focus: Performance, aftermarket appearance “upgrades” and nick-knacks. Novitec Rosso says they’re ” … the worldwide leader in customizing the great cars from Maranello.” Which makes sense, cause I can’t think of another one. The most interesting of the mods are, of course, under the hood. 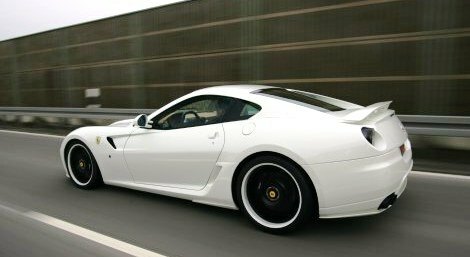 The Performance Stage 3, as Novitec Rosso calls it will cost you some serious bread, but hey, if you can afford a 599, you’re probably not worrying about that. The prices start at 10,490 Euros, which is around 13 or 14K, and that gives you a power bump from 620 hp to 660 hp, and they do this without altering the engine’s internals. You get new engine electronic engine management system with new mapping for ignition and injection as well as increase in maximum engine speed to 8,550 rpm. You also get a complete NOVITEC ROSSO stainless-steel high-performance exhaust system (and yeah, they’re another one of those companies whose name is in all caps, and no, I don’t know why). The exhaust system has a trick little feature where you can select a position on the steering wheel mounted ‘Manettino’ switch that activates a controllable exhaust flap to change the exhaust note from sporty yet subdued to what they term a “bona fide racing sound”. The redone engine mapping also gives you a slight boost in the top end, bumping the top speed by five km/h to 335 km/h. On the appearance side of things there’s a new front spoiler lip that reduces lift up front, and out back there’s a new rear wing and diffuser. There are also new rocker panels. The body tweak components are also available in clear-coated carbon fiber if you don’t want to color match them. NOVITEC ROSSO has also modified the taillights, side markers and auxiliary brake light along with new LED rear fog lights. Naturally, they had to work over the suspension and the wheels. There’s a cockpit-mounted button that raises the ride height by 40 millimeters so you can get over parking-garage ramps or speed bumps a little easier. When you reach 80 km/h the front of the car automatically drops back down to its normal ride height. The wheels are three-piece NOVITEC ROSSO NF3s that come in a rainbow of colors and are fitted with Pirelli high-performance tires. Up front you get 9Jx20 wheels with size 275/30 ZR 20 tires and out back, there’s 12.5Jx21 wheels with tires in size 355/25 ZR 21s. In addition to the familiar twin compressor engines with up to 808 hp / 594 kW NOVITEC ROSSO now also offers classic engine tuning for the six-liter twelve-cylinder four-valve engine. The Performance Stage 3, starting at 10,490 Euros, increases power output from standard 620 hp / 456.3 kW to 660 hp / 485.7 kW without any alterations to the engine’s inner workings. The NOVITEC ROSSO sport exhaust system features four tailpipes with diameters of 90 millimeters and is available in two different versions. In addition to a conventional version there is also a system with controllable exhaust flap. Using the little ‘Manettino’ switch on the steering wheel, the driver can change the exhaust note from sporty subdued to bona fide racing sound. For even faster and more precise shifting of the six speeds of the 599 GTB’s F1-Superfast transmission NOVITEC ROSSO offers longer carbon-fiber shift paddles. The NOVITEC ROSSO sport suspension allows both ride height and damper rates to be set according to each customer’s individual preferences. But that’s not all: By pushing a button in the cockpit the front of the car can be raised by 40 millimeters to safely navigate parking-garage ramps or speed bumps. Upon reaching a speed of 80 km/h the front of the car automatically reverts to its original position. 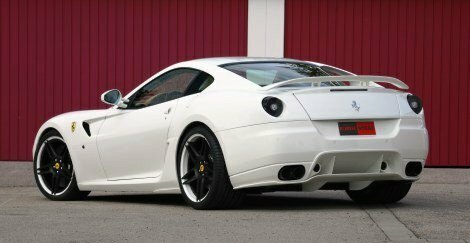 No Comments on "Novitec Rosso Ferrari 599 GTB"